Good morning and Happy WOYWW. I thought I'd take a piccie of my "heat it" station! I had a really cheap canvas that needed cheering up so covered it with Vintage Shabby Tim Holtz paper. I melted Beeswax on a low setting in the Melt Pot, stamped some images onto a single layer of tissue and applied them to the canvas using the wax. The stamps are also by Sir Tim. I covered a small square of Studio 490 Art Parts with the same paper, stamped a message and 2nd generation pattern then painted the wax over the top. The flowers and leaves were made from Spellbinder dies as where the flourishes. I used Hels tip of scrunching up the leaves before coating them in wax. The sides of the canvas and the Art Part were painted with Eco Green Black Acrylic Paint. It's a great range of paints and I love them because they dry really quickly. 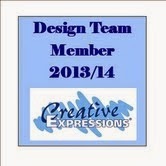 Everything I used is available from Creative Expressions. So, once again, many thanks to Hels for getting my Melt Pot mojo working again! I'm also entering this as my Sunday Stamper entry...it's nature themed this week. Pop over to Hels blog for details. I've got some candy up for grabs...please see previous post for details. It's a fab set of stamps and masks. Off to pack up the car with all the demo stuff...really looking forward to it and I'm taking the canvas with me to sit in pride of place! I'll try and get around to as many of you as I can but thank you for visiting and all your lovely comments...I was blown away last week. Wow, what a heat station lol! Love your card, I was just on Sir Tim's blog and saw that dragon fly stamp and thought "I want that"!! Beautiful work :-). I also hope that your demo goes well. Happy WOYWW. well done on getting your melt pot out again hasn't Hels done well this week so much inspiration. Lovely wax picture. I still have my first one hung in my room so no worries about it lasting time. Enjoy your workshop. Lovely sunshine on your 'heat station'! I gave my melt pot away and even Hels bless her, can't make me change my mind about it! What a rebel! Have a fun demo this avo. thank you for dropping by already and leaving a lovely comment! Lots going on in your crafty space, lovely card/canvas and sentiment. Have a great crafty week! ((Lyn)) was #52 now 51!! ah melted wax haven't done that since teens when we made candles oh what fun it was! had rather weird shapes some of them as we made them in whatever we could find. Love your price, great art! A heat station? What a good idea. I was thinking of a thinking station, but this might be more important. Lovely view of your window too. Hope it doesn't get too hot at the heat station! Wow - a heating station!!! I'm not tried working with wax yet. It's on my list.... need to find a cheap old pot at the thrift store! Your canvas turned out looking great!!! Its only my second week doing WOYWW. I'm late as I have had two huge busy days and just had no time to get to the computer. As well as when Julia posts the WOYWW post I am at work and its already in the evening here on Wednesday by then LOL. WOW I can only dream to have a room big enough to have a heat station...love it. Gorgeous wax card too. Isn't the smell of heated was divine! !